Imagine how bad this would be if we were still in the old system, where everyone used paper for everything. And I've heard that among programmers, a person who works without paper back-up is "jumping without a bungee cord". That used to be true - now we use thumb drives. When I had a part-time secretary, that helped a lot. She kept the correspondence in order and separate from my working papers. Now...that doesn't happen. This is actually more cluttered than I find optimal, which is why I took the picture, but I need clutter to function. I can't work in a totally organized environment. When I set up in a hotel room, I have to make the desk messy to work--spread magazines on it, or anything with color, shape, and texture. My mother the engineer couldn't figure out how I worked in clutter--it drove her crazy too, and she spent years making me clear my desk, only to see that halfway through a paper or homework assignment, I had it back to my own working conditions. I don't know why it's like that--but it's related to my not having "engineer mind," I'm sure. All the organization goes into the task in front of me, not the surroundings. I really prefer much less clutter in areas where I'm not working (not quite none--then it feels cold and boring and needs livening up) but the whole room doesn't really have to be this messy. Quite. What I learned from growing up with my kind of mind in a house with an engineer mother with a very different kind of mind is that not everyone's wired the same. So you, like my mother, need a more uncluttered environment, and some other writers (and probably more) like me, need a cluttered one. What works, works. 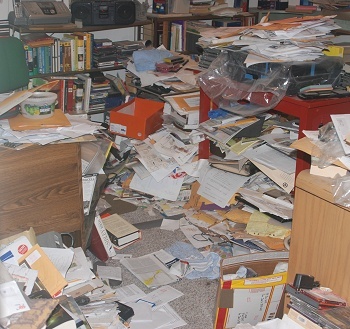 Long ago, someone who loved me dismissed the clutter with "you are bookish." So are you. Nothing is more paralyzing than an empty desk top with a blank piece of paper and a pencil. "This is actually more cluttered than I find optimal, which is why I took the picture, but I need clutter to function. I can't work in a totally organized environment. When I set up in a hotel room, I have to make the desk messy to work"
Oh, I SO love you for this. How did you get into my office? I can't tell you how comforting I find this photo. Edited to remove typo caused by bizarre LJ behavior. When I rated an office at my job, I was told that one requirement was to keep the chaos to a minimum. My boss realized there would be some but the deal is that it has to be somewhat contained. When I lived alone, parts of my house looked like this. Java is more into order than I am so there are fewer instances of this happening (except when we have a Major Cleaning Attack and run out of room and everything gets shoved into the spare room....). Of course now if most of the house looked like this it wouldn't for long because Feste would climb on stuff and re-arrange it for us (he is such a helpful cat). Well I've always gone by the train of thought that a tidy desk equals no work... well that's my story and I'm sticking to it. Whenever I shame myself into tidying things up I go crazy 'cos I can't find anything! I have you beat, actually, but at least partly because I'd spend an hour organizing things and a certain child would go in and undo half of it in under 5 minutes. There's a lock on the door now, I'm hoping to have it in much better order before school lets out for the summer next year. Makes me nostalgic for the days when I had my own writer around, whose office looked EXACTLY like this.